£50 non-refundable deposit is required to secure a booking. This is payable by cheque or bank transfer and to be returned with a completed booking form. Full Payment is required 6 weeks prior to holiday plus an additional damages deposit of £100. This will be returned within 1 week once inspection and inventory check have been completed on your departure. Please note that a lost key will be charged at £10. A key safe is provided on the caravan and should be used to avoid this. Please also ensure patio doors are locked before going out. If you have to cancel your holiday please inform us as soon as possible by telephone. We also require written confirmation and a refund cannot be given until this is received. If you cancel more than 6 weeks prior to your holiday start date a full refund will be given minus the £50 deposit. If you cancel less than 6 weeks prior to your holiday start date we will aim to re-hire the caravan. The £50 deposit will not be returned. You will receive a refund on the remainder if re-hired, minus any loss incurred as a result of re-hiring at a reduced rate as a last minute offer. Check out is no later than 10am on day of departure. Our caravan is strictly NO SMOKING. This also includes no smoking on the decking or pitch. If deep cleaning is required due to not adhering to this rule, damage deposit will be retained. Please leave the caravan and decking in a clean and tidy state and report any spillages/damage. Part/Full Damage deposit will be retained if there is any need for deep cleaning. Any Park Rules and Regulations must be followed. Please read our full terms and conditions before accepting them by completing and returning the booking form and deposit. The Beaumont is filled with all the little luxuries of home that really elevate it to the next level. This model features a beautiful master bedroom with built in wardrobes and an en-suite bathroom. 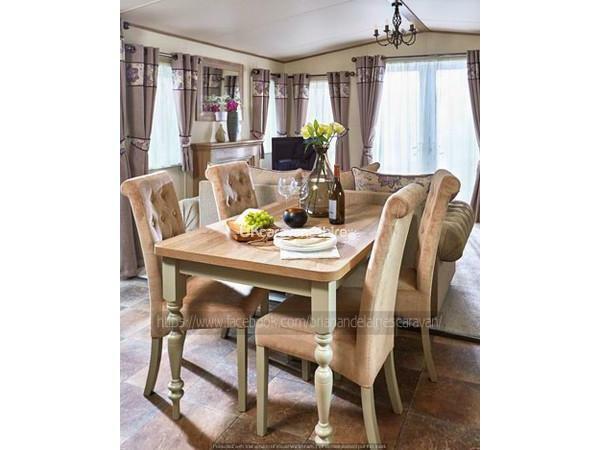 Stepping into the caravan from the side access door, your immediate impression is of luxury and comfort. The colour palette chosen for the Beaumont is muted creams to the furniture, light oak timbering on cabinets and units and an accent colour of light mauve – all underpinned by a light grey fitted carpet. The windows allow lots of natural light into the caravan and on dark days or at night, there’s a central multi-bulb pendant fitting and strips of spotlights in the kitchen area. 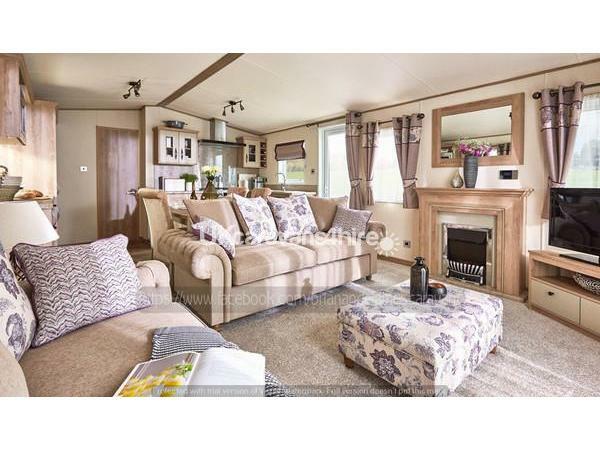 This caravan has double glazing and central heating throughout, private parking, fresh bedding and an open-plan layout which is great for families and couples. 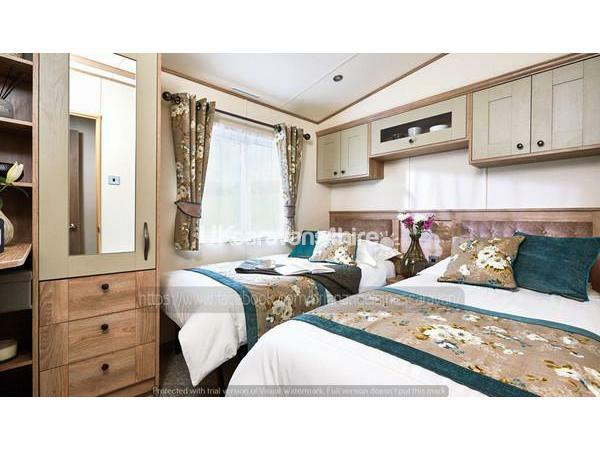 The caravan is pet & smoke free and is mainly used by us the owners throughout the year. It has a fully equipped kitchen with a full size fridge freezer, gas oven & extractor fan , microwave, kettle, toaster and all pots and pans. The lounge has free standing furniture, a 42 inch TV with a DVD player and a PS3 with games. The lounge leads onto the spacious full wraparound veranda which has a rattan effect patio set for you to enjoy during your stay. 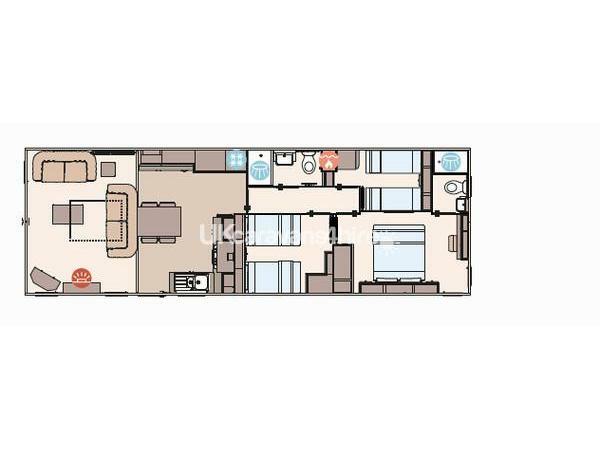 This model has extras...Blue Tooth Sound System, Integrated Washing Machine, Dish washer, Kitchen Larder Unit and Pocket Sprung Mattresses. 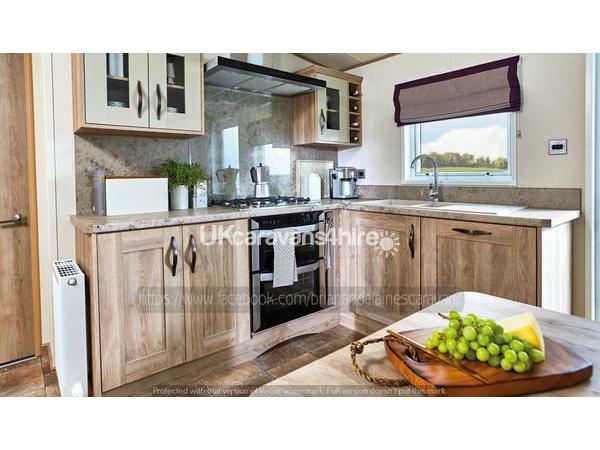 This top of the range caravan consists of 3 bedrooms and sleeps 6 people in total. The sleeping arrangements are 1 double bedroom, 2 twin bedrooms. 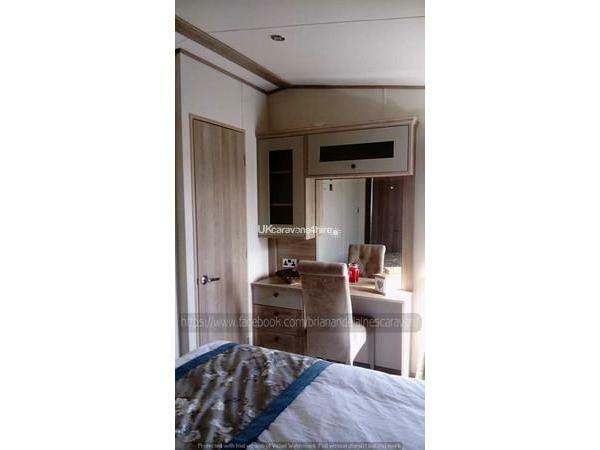 The master bedroom has a king size bed alarge amount of storage, a 32'' TV and also complete with a dressing table and mirror, as well as a seperate en-suite shower room. The first twin bedroom has two 3ft beds with lots of space to walk in between, a feature padded headboard that straddles both beds with central table, power sockets and a USB charger point. There’s an over-the-bed unit with three cupboards and integrated reading lights. 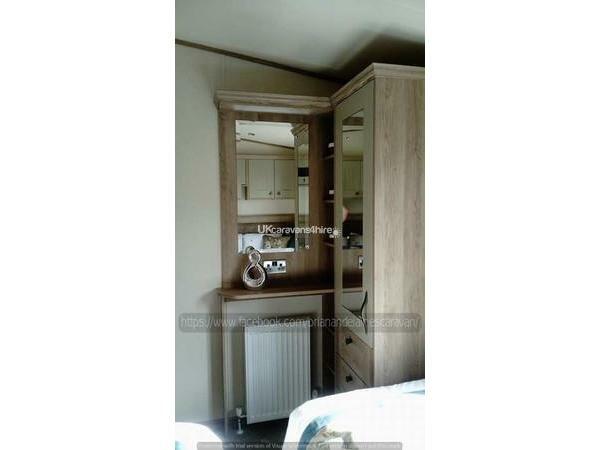 In one corner of the room is a very comprehensive vanity unit with shelves and a mirror plus a large hanging wardrobe with drawers below. The second twin bedroom has with 2 single beds with plenty of storage. All beds will be made up with fresh bed linen for your arrival. The shower room has a stylish hand basin a top storage cupboard, a mirrored cabinet with shelves and a shaver socket as well as a low profile double flush toilet. A large semi-opaque window lets lots of light into the room and there’s a stainless steel radiator that doubles as a towel rail. A corner cupboard houses the gas combi boiler. Towels are not included in our prices but these can provide a towel bundle if preferred. Check in for our caravan is from 1pm and check out time on your departure date is 10am. Our keys are kept in a key safe box which is fitted to the caravan. 1 hour before the arrival time you will be sent the code to open the key safe box, on your departure we ask for the keys to be returned back to the key safe box. Funworks passes for the complex onsite are not included in the rental cost of our caravan. FUNWORKS PASSES are to be bought from reception if you wish to use the parks facilities. Additional Info: (Some facilities may require membership)Pub/Club, Fishing, Amusement Arcade, Tennis Court, Indoor Pool, Laundrette, Grocery Shop, Takeaway, Restaurant, Kids Club, Funworks Entertainment Centre which includes large amusement arcade, kids play areas, splash pool and water slides, relaxation pool, Live Lounge Day and Night entertainment venue, Showbar Nightly Bingo and Entertainment venue. Lakehouse Indoor and outdoor pools with water slides and activities, outdoor bookable activities, climbing wall, high ropes etc. Mash and Barrel fun pub/restaurant and late night Karoake 3 nights per week peak season, Starbucks, Fun Fair, Go Karts, Waltzers, Dodgems and much more, Bumper boats and Pedloes on the lake, Aerial Activity cetre and a Lakehouse sports bar which has just had a £3m upgrade.